A month after cartel warfare forced residents of the Mexican city of Ciudad Mier to abandon their homes and seek refuge on the Texas side of the border, they have tentatively started to make their way back, buoyed by the presence of three military battalions. What happens when the soldiers leave is anyone's guess. The Mexican city of Ciudad Mier is limping back to normalcy a month after residents were forced to abandon their homes amid threats by the notorious Los Zetas cartel. Mier, which sits about a half-dozen miles from the Texas border in the Mexican state of Tamaulipas, looked this week like a city rebuilding after a war between the Zetas and the Gulf cartel closed schools and businesses and left a majority of buildings abandoned and strewn with broken glass. The police station is now a charred shell in which a filing cabinet sits half-opened and riddled with bullet holes. Just blocks from the city’s northern entrance, a worker with the federal electric company, Comisión Federal de Electricidad, was installing transformers after a ferocious gun battle between the warring gangs knocked out power to the main thoroughfare. A month ago, hundreds of residents with no place else to go were holed up at a Lions Club reception hall in the town of Miguel Alemán, just 11 blocks from the port of entry, while hundreds of others sought shelter with family or friends in nearby border cities. On Tuesday, the Lions Club was closed, and the makeshift shelter's gates were padlocked — a sign that refugees were slowly making their way back home. “Ciudad Mier has bounced back again and again after several beatings, and it will again this time,” says Sergio Higareda, the director of the city’s cultural center, which is housed in a rustic building in the central plaza. 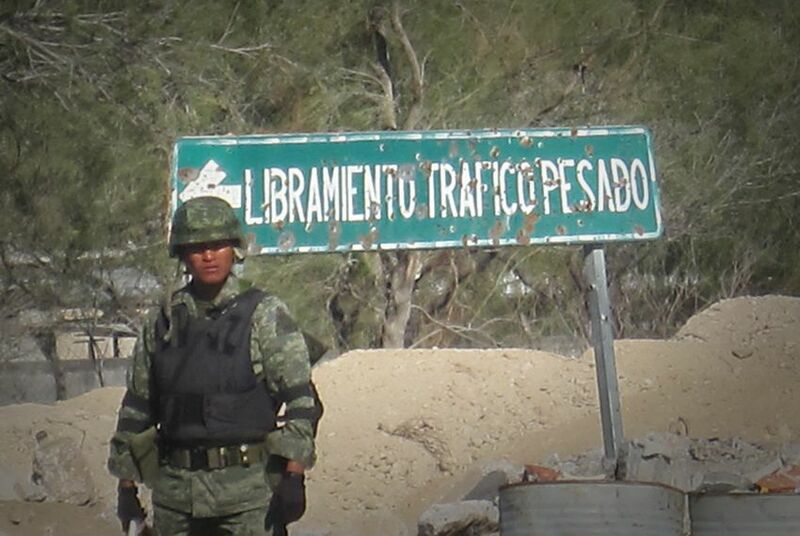 Residents have returned because of the presence of the military, says Isabel Cristina Treviño de Mancias, the director of the city’s branch of Mexico’s public assistance and welfare agency, Desarrollo Integral de la Familia. Three battalions arrived about three weeks ago and now patrol Mier, Miguel Alemán and the nearby town of Guerrero. What happens when they leave, she says, will determine the city’s immediate future. “They are here at least through January, and we are talking to the government about keeping at least one battalion here for six months after that,” she says. The decision rests with Tamaulipas Gov. Eugenio Hernández Flores, who visited the office last month. Juan Gabriel Badillo, a supervisor with the Secretaría de Desarrollo Social, or Sedesol, the federal government’s social policy directorate, says his most recent count has Mier's current population at 3,000, or about 842 families. It’s hard to get an accurate count, he says, because some residents leave at night or return only on weekends. Badillo and about 120 Sedesol workers were dispatched to the area, a practice usually reserved for natural disasters, to evaluate the city’s progress, to talk to educators about the effects of the exodus on students and to submit proposals to bring the town back to life. The response from residents of the Texas city of Roma, just across the border from Miguel Alemán, was generous, Treviño de Mancias says. “They treated us very well,” she says. After hearing about the exodus, several churches and private businesses began asking for donations for the displacement camp at the Lions Club. One restaurant served as a drop-off point for donations, and others, with family ties to Ciudad Mier and Miguel Alemán, delivered diapers and formula for the children affected. “It wasn’t a whole lot, but they did what they could,” she says. The violence that led to the exodus didn’t unsettle Roma residents, according to the city's police chief, Jose Garcia. “We have our share of crime along the border, but it hasn’t increased," says Garcia, who notes that the only real concern as of late is the feeling of insecurity that’s commonplace of late along the Texas-Mexico border. Why did his community rushed to support the Mexican refugees? "A lot of people have families on the other side,” he says. Ricky Perez, a spokesperson for the Roma Independent School District, says enrollment in the city's public schools has increased by about 200 students in the last month. But the increase hasn’t stoked fears of potential harm to the student body. On the contrary, he says, it’s because Roma ISD has a reputable police force of its own that the student population has increased. Back in Mier, fear is a more familiar feeling for some of those who have chosen to return. One man who asked not to be identified said this week that after the sun goes down, the streets are empty. “It was called a pueblo mágico [a magical place], but it might as well be a pueblo de fantasmas [a ghost town],” he said. Indeed, about an hour after Higareda’s emphatic assertion that Mier will bounce back, a caravan of state police pulled up outside the Plaza Hidalgo. Occupants of the van it was escorting exited, all clad in body armor, as policemen stood guard on the sidewalks. The few residents lingering on the streets headed inside, and doors that stood ajar only minutes before quickly closed and remained so until the caravan left.